Wild Birds Unlimited: What kind of bird bath is the best? What kind of bird bath is the best? Water is one of the most important necessities that birds need year-round. If you are thirsty where do you go? Finding safe, clean water is often difficult for birds. By offering a bird bath you can make a bird’s life a little easier. Baths not only provide clean water to quench thirst, baths also help birds maintain their feathers. A good part of a bird's day is spent just cleaning and grooming their feathers by bathing, scratching, and preening. It’s so important that it is often the first place parent birds bring their newly fledged babies. Right now there are also lots of birds traveling thousands of miles between wintering grounds and nesting grounds that just need a place to stop. As forests have been cleared for development, birds have to find sanctuary in whatever forest, woodlot, or yard that is available when they become too tired or encounter bad weather on their journey. And if they choose your yard to stop over, hopefully you’ll have fresh water, food, and shelter to make their journey a little easier. I know in the next couple months I’ll be seeing warblers, tanagers, buntings, and variety of other birds stopping at my water bath as well as visits from my regular cardinals, chickadees, and finches. Water will attract all species of birds. It's one of the easiest ways to bring birds up close, so the whole family can get a really good look and enjoy their beauty. Depth – I like a bath with a gradual dip to the middle no deeper than 2”. If your bath is any deeper, it’s nice to place a stone in the middle for the birds to make an easy escape. Size – Baths can be any size. I have a very shallow tiny bath staked near the ground that the cardinal and goldfinches frequent and a large bath a little father away that the robins and doves prefer. Appearance/Material – Wild Birds Unlimited - East Lansing stores have a variety of bird bath styles from glass, ceramic, metal and plastic. As long as the water is fresh and the birds feel safe, all the baths will attract birds. Location – In nature water is usually found on the ground or perhaps pooled in the leaves of a plant after a rain. Birds will come to the water at any level, so place the bath where you can see it easily to enjoy the birds. Water Movement - Moving water will attract birds and can minimize insects and algae growth. 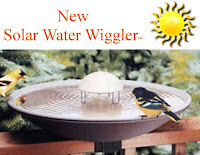 Adding a mister or water wiggler can be fun. Maintenance – It is important to keep you bath clean. 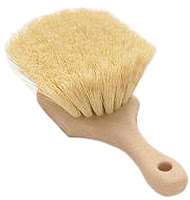 Make sure to have a good stiff brush to scrub you bath occasionally and I also add a specially formulated bird bath protector to the water to prevent organic contaminants from forming and keep the water clear. Everything is available at Wild Birds Unlimited - East Lansing store.